This is a form of graduated prohibition of cigarettes – essentially making cigarettes unviable as recreational nicotine delivery devices by making it impossible to draw nicotine with pharmacokinetics that provide an adequate psychoactive reward. As such it suffers from generic problems of prohibition…. A really useful comment on this one… Some vapers just don’t seem to know what we’re up against! 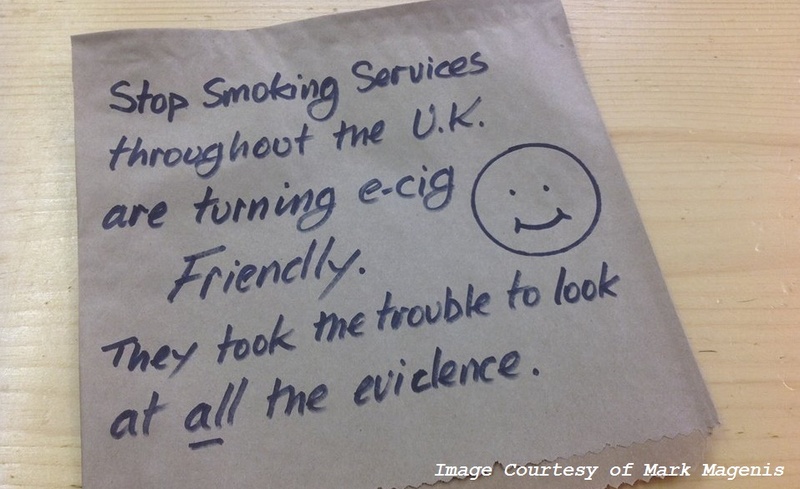 Sarah Jakes discussing E-Cigs today – Thanks as always to @dnglos for “YouTubing” this! In a Jekyll and Hyde fashion, Dr. Stan Glantz has taken two opposite positions on the issue of whether reducing cigarette consumption can convey health benefits. If you reduce cigarette consumption using e-cigarettes, it has no health benefits, Glantz says. But if you reduce cigarette consumption by switching to low-nicotine cigarettes, it does have health benefits, according to Glantz…. The initiative would impose a $2-a-pack tax that would largely fund Medi-Cal. It would also tax electronic cigarettes, products that typically heat nicotine-laced into a fine vapor. Health advocates have pushed to regulate e-cigarettes as tobacco products, pointing to the exploding popularity of “vaping” among teenagers. Jacques Le Houezec – Google Translate is your friend! A more practical approach is needed to make e-cigarettes available to smokers who want to stop smoking conventional cigarettes. Newly published research has cast doubt on claims that e-cigarettes attract non-smokers, it has been claimed. The Welsh Health Survey asked regular users of vaping devices if they had previously been tobacco users – and almost every single respondent said yes. The statistics have led the Liberal Democrats to claim they undermine health minister Mark Drakeford’s argument that e-cigarettes act as a gateway to smoking. But the Welsh Government has dismissed those comments…..
“We are supportive of the bill’s policy intent, the harmful effects of tobacco and smoking are undisputed, as well as the effects of second hand smoke, particularly for children. We are pleased to see the Health and Sport Committee’s recommendation that the driver be held criminally responsible, as they are the ones who have control of the car and have a duty to ensure the safety and wellbeing of their passengers…. 30 years 2 packs a day started vaping Feb 12 2014. By Feb 20th no more cig. Lung function @ that point 46% copd imminent @ 45 years of age Today @ 47 haven’t had 1 cig. Lung function 97%. I am proof! !